The hotel was built in 2000 and offers 70 modern and comfortable equipped rooms and restaurant + meeting zone. Extra beds are available for 1000 roubles per day. Staff speaks english and french. Breakfast included for all prices. Peak season lasts from 01.06. to 30.09. All rooms are with bath, mini bar, TV and telephone. Other services: 24 hr reception, restaurant, bar, conference rooms, travel agency (tickets for railway and airplane), exchange office, bankomat, hairstylist, sauna, laundry service. VISA and MasterCard are accepted. Children under 12 years don't have to pay. The hotel is located directly in the opposite of the exhibition complex "Sibexpocenter", 10 minutes by car from city centre. The hotel has the brand of a west european standard hotel. The staff at reception speaks a few foreign languages and is very helpful and co-operative . Exkursions to Lake Baikal and surroundings are possible on demand. Rooms on the 2nd and 4th floor with simple furnishings. Rooms from 5th till 8th floor are more comfortable with bath/shower, TV, telephone, mini bar, air-conditioning. In the hotel you can also find a post office, access to internet, fax, copier , exchange office, restaurants, a hairstylist, sauna, a dentist, a travel agency, shops and a casino. Credit cards are accepted. The hotel is situated centrally at Kirov Square. From outside it looks like a typical soviet new building but if you come inside you will find a comfortable hotel with west european standard. Only the staff is not very cooperative. Breakfast included. The hotel is situaed directly in the city center on the main shopping mall. With 30 rooms one of Irkutsk`s smaller hotels (3 stars). Breakfast included. Extra beds can be ordered for 1500 roubles per day. The Hotel was built in 2004 in a small park and offers 64 rooms/suites. 2 kilometres from the city center. In addition to a restaurant, banja and meeting service the hotel offers transfer service to the center. Staff speaks english. 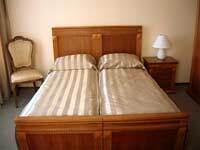 Nice small 3-star-hotel with 12 rooms in the business area of Irkutsk. All rooms with toilet/shower, air-conditioner, phone, satellite television, mini-bar and safe. On the first floor there is a restaurant for up to 30 guests. Extra beds are available for 600 roubles. Staff personal speaks english, german and french. Alle prices with breakfast. Staff personal speaks english. Extra beds cost 2500 roubles per day. New 4-stars-hotel from 2009. The hotel is situated in a business center with the same name and offers 25 rooms. No single rooms. Breakfast is included for all prices. One of the city`s best hotels (4 stars) with 52 rooms, but situated a little bit outside. Price for extra beds: 2500 roubles/day. Breakfast included. Extra beds can be ordered for 1000 roubles per day. The rooms are equipped with TV, shower and toilet. In the hotel you can find a sauna, hairstylists, a doctor, shops, a car rental, copier service and a travel and information agency. Conference rooms and translator are possible on demand. The hotel, a typical new building of soviet style is set centrally at the bank of the Angara river. Good service level. With 197 rooms the city`s biggest hotel. All prices with breakfast. Staff personal speaks english. Good hotel renovated in 2007, which is situated in a very quiet area close to the decabrist museums of Trubezkoy and Volkonskiy. 3-stars-hotel with 56 rooms and 82 beds categorized as half-luxury, luxury and luxury plus. Breakfastis included. All rooms with TV and telephone. Also in the hotel are located a restaurant, a bar, gift shops, a hairstylist, laundry service and sauna. You can order conference and bankett service. For 100 roubles a hotel owned microbus takes you to train station or airport. The hotel is situated centrally, bands and a coffee bar with internet access are nearby. Good service level and friendly staff. Theme-orientated excursions to Lake Baikal and environment for 1 up to 10 days are offered. Several wooden houses at Lake Baikal are for rent in the hotel. The small hotels Retro-1 and Retro-2 are also run by the hotel group RUS. The hotel offers moderate prices and is really popular among artists, actors and musicians, so it`s possible to meet celebrities of the regional art-scene here. From time to time the Irkutsk Art-Club takes place here as well. The hotel offers 25 rooms altogether. Guests of the economy-rooms have to share shower/washroom with 2 other rooms. Various standard-rooms with different prices are for rent. Prices without breakfast. Extra beds cost 1000 roubles per day. The small hotel is situated on the shores of Angara river (left side) on the territory of the Technical University. 10 rooms on are available, all of them on one floor. All rooms with shower/toilt. From 12 to 18 o`clock it`s possible to book the rooms for separate hours. Breakfast included. Staff personal speaks english. Extra beds can be ordered for 1000 roubles per day. The away is about 200 meters away from the airport and should be in good condition after having been restaurated in 2006/07. Besides of the hotel there is a fitness-club and a small stadium. Prices without breakfast. Extra beds are available for 1100 roubles per day. Small hotel with 7 rooms on the left shore of Angara river. Only half-luxury and luxury-rooms are available. Breakfast included. Staff personal speaks english and spanish. 3-star-Hotel opened in 2007 which offers 49 rooms on five floors. Next to the Cathedral of the Epiphany and to Angara river. Situated right downtown. The hotel can accomodate up to 80 guest and offers a restaurant, a bar and lockboxes. The hotel Orion is a so-called "flat-hotel", i. e. separate flats (14 altogether) are for rent in a ordinary high-rise building which is not very esthetic. Standing outside, it`s hard to realize that here could be a hotel, only the information board at the entry tells us more. All flats with kitchen and washroom. Economy-hotel with 9 rooms for up to 42 guests. There are 2 dorm rooms for 4 and 7 people. On the floor there are 2 shower cabins, 4 toilets and 6 sinks for all guests. The hote was opened in 2007 and is situated 10 km away from Irkutsk in direction to Lake Baykal. Obviously, it`s organised by chinese owners and offers 66 rooms and 114 beds.